In the photoelectric effect, a photon ejects an electron from a material. Researchers at ETH have now used attosecond laser pulses to measure the time evolution of this effect in molecules. From their results they can deduce the exact location of a photoionization event. When a photon hits a material, it can eject an electron from it provided it has enough energy. Albert Einstein found the theoretical explanation of this phenomenon, which is known as the photoelectric effect, in Bern during his "year of wonders" 1905. That explanation was a crucial contribution to the development of quantum mechanics, which was under way at the time, and it earned him the Nobel Prize in Physics in 1921. An international team of physicists led by Ursula Keller at the Institute for Quantum Electronics of the ETH Zurich has now added a new dimension to the experimental investigation of this important effect. Using attosecond laser pulses they were able to measure a tiny time difference in the ejection of the electron from a molecule depending on the position of the electron inside the molecule. "For quite some time, people have studied the time evolution of the photoelectric effect in atoms", says Ph.D. student Jannie Vos, "but very little has so far been published on molecules." That is mainly due to the fact that molecules are considerably more complex than single atoms. In an atom, the outermost electron moving around the atomic nucleus is essentially catapulted out of its orbit. In a molecule, by contrast, two or more nuclei share the same electron. Where it is located depends on the interplay between the different attractive potentials. Exactly how the photoelectric effect happens under such conditions could only now be studied in detail. To do so, Keller and her co-workers used carbon monoxide molecules, which consist of two atoms – one carbon and one oxygen atom. Those molecules were exposed to an extreme ultraviolet laser pulse that only lasted for a few attoseconds. (An attosecond is the billionth part of a billionth of a second). The energy of the ultraviolet photons ripped an electron out of the molecules, which subsequently broke up into their constituent atoms. One of those atoms turned into a positively charged ion in the process. Using a special instrument, the researchers then measured the directions in which the electrons and ions flew away. A second laser pulse, which acted as a kind of measuring stick, also allowed them to determine the precise instant at which the electron left the molecule. "In this way we were able, for the first time, to measure the so-called Stereo Wigner time delay," explains Laura Cattaneo, who works as a postdoctoral researcher in Keller's group. 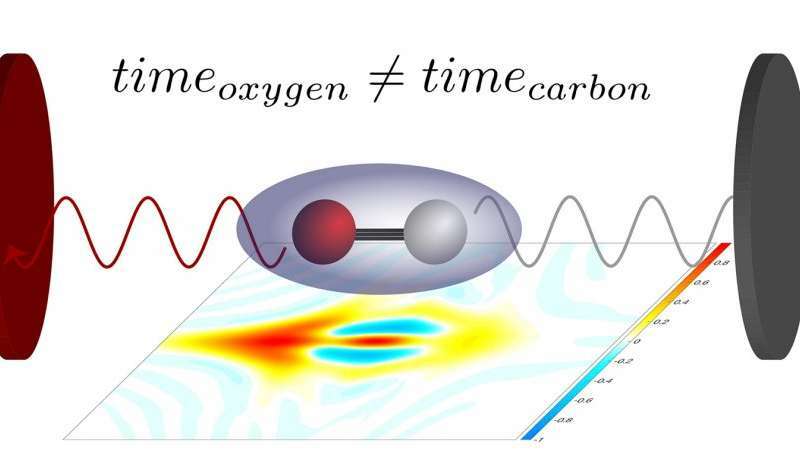 The stereo Wigner time delay measures how much earlier or later an electron leaves the molecule if it is located close to the oxygen atom or to the carbon atom when photoionization occurs. The extremely short laser pulses make it possible to measure that instant to within a few attoseconds. From that information, in turn, it is possible to determine the location of the ionization event inside the molecule to within a tenth of a nanometre. The experimental results agree well with theoretical predictions that describe the most likely position of an electron at the time of photoionization. Next, the ETH researchers want to take a closer look at larger molecules, starting with the laughing gas N2O. The extra atom in that molecule already makes the theoretical description quite a bit more difficult, but at the same time the physicists hope to obtain new insights, for example into the so-called charge migration inside molecules, which plays an important role in chemical process. In principle it should even be possible to use attosecond laser pulses not just to study those processes, but also to deliberately steer them and thus to control chemical reactions in detail. Right now, however, such atto-chemistry is still a long way off, as Jannie Vos points out: "In theory that's all very exciting, but a lot remains to be done before we get there."